The Blackstar HT-Delay is a powerful delay effects unit that combines versatile, high quality delay effects with Blackstar’s amp design know-how. Delay is an essential guitar effect, and among the most varied and flexible to have in your sonic arsenal. From simple slap-back delays, to complex, filtered and modulation effects, a delay can provide a multitude of different tones. The HT-Delay is designed to provide every type of delay your heart may desire, but packaged into a circuit that incorporates a real valve. We all know what valves mean- big, warm valve tone! Woo-hoo! This is designed with a 300V High Tension circuit- just like a valve amp. As a result, it behaves as an amp would, cleaning up when the guitar volume is backed off, and compression and distorting with classic tube character. This is done via the saturation control. In total, there are eight different delay types on offer here: linear, analogue, tape, two multi-head tape delays, space and two loop modes. The tone can be tweaked further by time, feedback, saturation and level controls. The two loop modes offer a one-shot/ loop playback feature, to trigger recorded loops, and an overdub feature. As with all Blackstar products, the HT-Delay is constructed to the highest standards. The heavy-duty chassis is robust, and rugged- perfect for a life of being stood on(!) The combination of soft switching and a buffered bypass ensures that switching is absolutely silent. 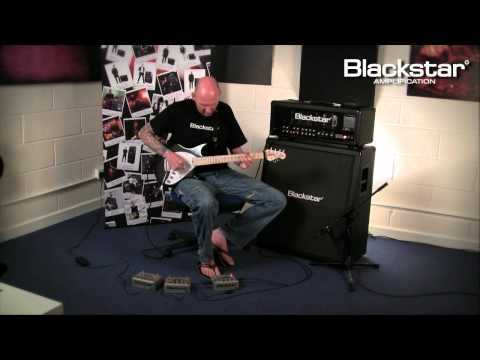 The Blackstar HT-Delay, is tough, versatile and, crucially, sounds great. It may be the only delay you ever need.